As with most things around your house and garden, regular maintenance of your garage doors is essential to avoid damage and unneeded expense. Most people simply do not take care of their garage doors until something goes wrong and they must pay a professional to come out and repair them, or even replace them completely. Not all garage doors are created equal, it’s well worth knowing exactly what type of garage door you have and how it operates, so if something does go wrong you know what type of help you need or if it’s something that you feel confident you can resolve yourself. Here are some top Garage Door Maintenance Tips that will keep them in good condition and maximise their lifespan. A garage door is opened and closed thousands of times in its lifespan, inevitably, parts will come loose. To reduce jerkiness and ensure smooth opening and closing of your garage doors, routinely check over the roller brackets and bolts, tightening up with a socket wrench when necessary. 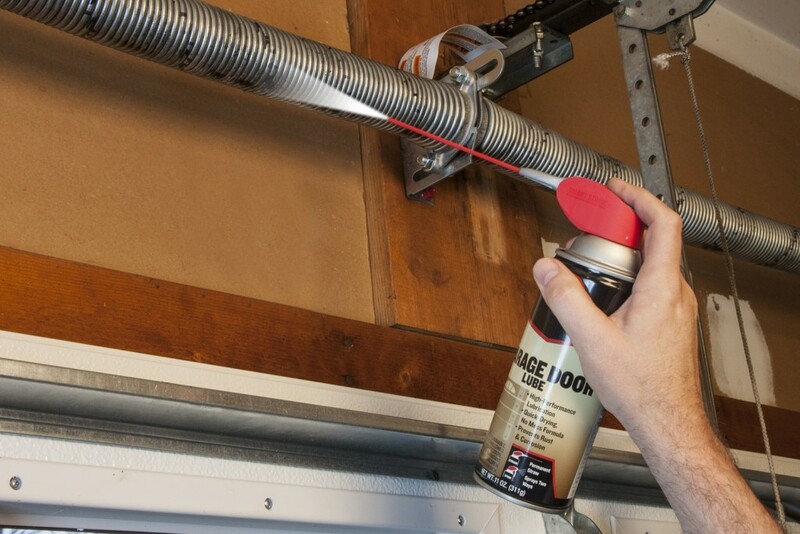 Over time the rollers on your garage door will wear and need replacing, to prevent damage to the tracks and other internal mechanisms, you should replace the rollers, on average, every seven years. Inspect the rollers twice a year and if you notice they are cracked or worn replace them as soon as possible. Garages are a safe, secure and dry place to keep valuable items such as cars, DIY tools and sports equipment. To prevent mother nature from causing damage to the interior of your garage and the items you keep inside, it’s important to ensure the weather stripping at the base of your garage door is in good condition. Regularly check the stripping for cracks and wear and change when needed. To increase the lifespan of your rollers and tracks and ensure smooth opening and closing of the doors with minimal noise, lubricate your tracks and other moving parts regularly. Oil based lubricants attract dust and build up grease so it’s recommended to only use silicone based sprays. To avoid injury to yourself and others when operating the garage door and prevent damage to your door opener, it’s important that your door is evenly balanced. A balanced door will hold the halfway position without assistance. If the door pulls back up or falls the tension needs adjusting, it’s best to call a professional to do this for you. Visually check the high-tension cables that lift your door for signs of damage and fraying. If you can see visible damage do not tamper with or attempt to change them yourself, as you risk serious injury or even death. Always call a professional. Over time it is inevitable that wooden and steel doors will wear with age. Water damage can cause wooden doors to warp so it’s wise to reseal or paint annually to prevent this. Steel doors can develop rust spots that if not treated can spread; sand down rust spots when they first appear and seal with an exterior paint suitable for steel. Finally, it is recommended that you have your garage doors serviced by a professional annually. They will identify and fix anything that needs repairing and ensure your garage doors stay in tip top condition!